Every year I spend a good deal of time and expend a lot of thought into making a yearly top ten list of the best in cinema, and for as open-minded as I am I have noticed over the years that it’s pretty rare for a pure undiluted comedy to make those lists. Movies that are sort of hybrid comedy/dramas are actually kind of common, in fact my 2017 list had three movies that could be argued to be comedies in The Square, Ladybird, and Three Billboards Outside Ebbing Missouri but these are not generally movies people go to when they’re straight up looking to laugh at a movie theater. Outside of those edge cases the comedies that usually make year end lists are movies like Birdman, Moonrise Kingdom, and The Wolf of Wall Street which have a whole lot going on in their production beyond their apparent wit. I don’t think this is exactly a bias that I’m alone in. If you look at most top ten lists and Best Picture slates you’ll probably see a similar pattern and it maybe says less about critics and more about how unambitious dedicated comedians can sometimes be in their craft. As if being funny is in itself so hard that they can’t be bothered to also build a great movie around a great set of jokes. I bring all this up because I think the highest a 100% comedy has ever gotten on one of my top ten lists was in 2009 when I put Armando Iannucci’s dark political comedy In the Loop in my number two slot right behind Quentin Tarantino’s magnum opus Ingourious Basterds (itself a semi-comedy), and the new film The Death of Stalin is in many ways Iannucci’s follow-up to that future comedy classic. The film is set early in 1953 and begins with Joseph Stalin (Adrian McLoughlin) at his most powerful and most feared. NKVD agents (the spread police) are actively hunting down people on lists made by the party and throwing them in gulags and or executing them. We spend a great deal of time early in the film watching a producer (Paddy Considine) at Radio Moscow scramble beyond reason to recreate a broadcast the dictator has requested a recording of just to establish the extent to which the normal Soviet citizen will piss their pants at the possibility of having slighted this regime. But this will prove to be something of a turning point because the night of that broadcast Stalin suddenly becomes violently ill and it becomes clear to everybody in his inner circle that there’s about to be a transition of power in a global superpower and they immediately start jockeying for power. Lavrentiy Beria (Simon Russell Beale) begins trying to paint himself as the people’s advocate, much to Nikita Khrushchev’s (Steve Buscemi) chagrin and both men try different approaches to gaining the favor of Vyacheslav Molotov (Michael Palin) and manipulating the parliamentary process that Georgy Malenkov (Jeffery Tambor) rather lackadaisically tries to assert. They also try to gain the favor of army officer/war hero Georgy Zhukov (Jason Issac) and to manipulate Salin’s heirs Svetlana Stalina (Andrea Riseborough) and Vasily Stalin (Rupert Friend). Iannucci’s In the Loop was more or less an adaptation of a British TV show he ran called “The Thick of It.” These were both projects that sought to demystify politics by suggesting that behind closed doors elected officials were petty and vulgar people who would make decisions for entirely self-serving reasons, but not in a glamourous way like on “House of Cards,” more like the kind of relatable human shortcomings on something like “The Office.” If this sounds familiar to American audiences it’s because after the success of In the Loop Iannucci tooke this idea to HBO and created the much awarded series “Veep,” which is if anything even more cynical in its outlook. 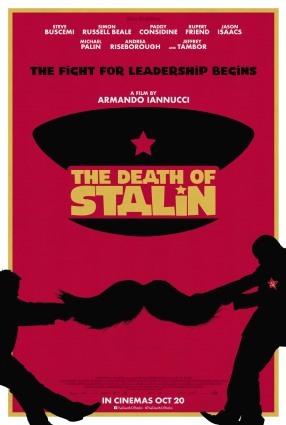 With The Death of Stalin Iannucci has perhaps taken this idea to its logical extreme by applying it to one of the most infamous regimes in world history. The various Stalin cronies who begins sniping at each other here are a bit smarter and more competent than some of the politicians Iannucci has brought us elsewhere but their personalities and shortcomings are not dissimilar from what we’ve seen in the director’s other films. The key difference is that here’s they’re playing games that have life or death stakes to a degree that some of his other characters aren’t. I’m not terribly knowledgeable about Soviet history and when it came to do with this particular power struggle I didn’t go in knowing much except for the fact that it wasn’t Lavrentiy Beria who would famously end up on the other side of the Cuban Missile Crisis. Consequently I’m not terribly knowledgeable about the specifics of how accurate this film is but I have a hunch that the movie’s approach is to be very accurate about the facts of what went down during this period while changing the tone of everyone’s mannerisms to fit more with Iannucci’s usual vision of how politics happens. One part of this is that he’s casted nothing but British and American actors in the various Russian roles in the film and has clearly instructed them not to attempt any kind of Russian accent but to simply speak in their usual comic voice. In the case of Stalin himself, who sounds like a “cockney geezer” I’m not sure this works, but for the rest of the movie it was a shrewd choice which really brings out the personalities in these characters who might otherwise be kind of hard to relate to on any level. For instance, the Georgy Malenkov here is like the guy who finds himself in a position of authority and Beria is like the guy who’s got a plan but is so transparent in implementing it that people move against him while Khrushchev is like the guy who doesn’t have the force of personality to speak up in a meeting but ultimately sees things a bit more clearly than the people around him. The Death of Stalin is a movie I’ve been pretty excited about ever since it started getting raves on the festival circuit and in part because of the buildup I must say that as audacious as the film was and as much as I could see the wit here the movie never quite lived up to my high expectations. The movie is certainly funny, but it never quite had me in stitches like In the Loop did. I think part of that might simply be that after In the Loop and six season of Veep this particular brand of comedy might just not have quite the potency it used to. I also suspect that the foreign/period setting might have taken a few weapons off the table. The writing here can’t really employ pop culture references for example and the actors don’t quite seem to have the same freedom to improvise that they might have in some other contexts. Additionally there are a couple stray elements here that just feel a little sloppy like the occasional title cards which pop up to display applicable Soviet laws which don’t look great and aren’t really used frequently enough to fully integrate into the film’s grammar. That’s a minor quibble but I think the bigger thing holding this back is that making a movie about a foreign country’s history simply feels less subversive than mocking one’s own government. If this had been made while the Cold War was going on or been made by Russians it would have felt really daring, as it is it just feels like a strange but mostly well executed bit of gallows humor. But “strange but mostly well executed bits of gallows humor” don’t come along every day so perhaps I should stop complaining. Despite being a major world power Russia really doesn’t have the strongest filmmaking legacy. That the country was run by a totalitarian government that suppressed free speech for much of the 20th Century almost certainly had something to do with this. There aren’t too many movements or collectives you hear about in Russian film, rather there tends to be one dominant figure who acts as the standout Russian filmmaker in any given era whether it’s Eisenstein in the 20s and 30s or Andrei Tarkovsky in the 60s and 70s or Nikita Mikhalkov in the 90s. For the 2000s and 2010s the most acclaimed Russian filmmaker, by a fairly wide margin, is Andrey Zvyagintsev. Zvyagintsev is not necessarily the most popular figure with Russia’s Ministry of Culture but he consistently proves more popular than his countrymen at film festivals and has a solid following in the West and would likely be even more widely discussed if people knew how to pronounce his name. His reputation has only expanded with the release of his latest film Loveless, which did quite well at Cannes and which was also one of the 2017 nominees for Best Foreign Language film. Loveless looks at a rather unpleasant married couple who have already resolved to divorce as the film begins. The husband, Boris (Aleksey Rozin), has apparently been having an affair with a younger woman named Masha (Marina Vasilyeva) who is already pregnant with his child while the wife, Zhenya (Maryana Spivak), has been having an affair with an older man named Anton (Andris Keišs) who she considers much more gentlemanly than Boris. Caught in the middle of all this is their twelve year old boy Alexey (Matvey Novikov), who is often ignored and neglected as his parents fight among themselves. One day the parents realize that their son has disappeared and may have been gone for a couple of days without them having noticed. Receiving little help from the police the two find themselves hiring some sort of private investigator to help track down the kid but their internal conflicts continue to plague both of them. Andrey Zvyagintsev started his in the early 2000s with a film called The Return and has continued to make a number of intentionally cold little slices of life that feel meditative while still telling stories and having plots that can be grasped. His last film, Leviathan, was something of a departure in that it had more of a streak of satire, albeit of the pitch black variety, and had more of an allegorical level. 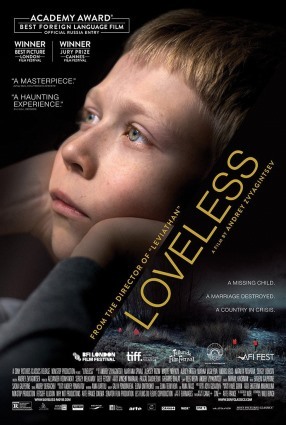 His new film, Loveless is a bit of a return to the style of something like Elena which simply takes an artful look into the abyss of bourgeois existence. As usual Zvyagintsev films the movie by making great use of a still frame and giving the whole thing a sort of artful gaze. It’s kind of like what David Fincher’s films would look like if he worked on less commercial projects and generally slowed things down a little. Zvyagintsev also makes great use of these Moscow locations which certainly don’t seem to be lacking in money but which are still rather desolate and kind of depressing. One of the film’s producers has said the movie was about “Russian life, Russian society and Russian anguish” but despite that quote I do think people are being a little reductive when they look at the whole movie in terms of its Russian origins and reductively call it a movie about how unpleasant that country can be. After all, there are loveless marriages and missing children everywhere and I think the film does tap into a type of malaise which exists far beyond Moscow. The film also shouldn’t be mistaken for some sort of argument for traditional family values as the movie is careful to also critique the society the way society pressured them into marrying when young and how it continued to keep them together despite obvious incompatibility. There’s an odd sub-plot in which Boris is told by a colleague that his Christian fundamentalist bosses require that all the employees at their company be married with children and will fire him if its learned he’s divorcing, a policy which is pretty clearly only leading everyone involved to misery, but the problems these two people are facing are bigger than this of course and the film offers little hope at the end that their separation will really solve all their problems. That general air of miserableness is not going to endear the film to all audiences, and as with most Zvyagintsev I find I probably respect it more than I love it, but it’s hard to deny it’s a strong piece. Jim Henson is not a guy you think about all that often as a filmmaker but he does have a pretty substantial legacy across many mediums. This is, after all, the guy who created a TV show in Sesame Street that teaches damn near every child how to count and his roster of Muppets have been entertaining children since the 70s. His legacy on the big screen is still notable but perhaps a little less titanic. A bit of a George Lucas figure, Henson produced and more or less envisioned several movies “starring” the muppets but only officially directed one: The Great Muppet Caper. Beyond that he only has two more director credits on theatrical films: the 1986 film Labyrinth (which I’ll be getting to in a later installment) and the 1982 film The Dark Crystal, which will be the film I’m looking at today. The Dark Crystal is a film I knew only by vague reputation. It’s not a movie that critics generally have much to say about one way or another and while people do talk about it nostalgically it’s not generally a movie that people claim as a “favorite” that they watched a million times as a child. In fact when people do talk about the movie they generally talk about having been disturbed by its dark nature of frightened by its content. That is a big part of what piqued my interest about the film. 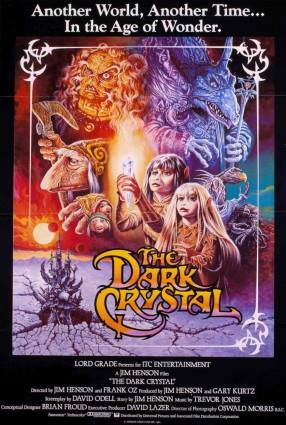 In case you haven’t noticed I generally like my family movies to be darker, at least in theory, and I’ve long suspected The Dark Crystal was a movie that I would have liked if I had known about it when I was young. A lot of my hope for the movie kind of got deflated pretty quickly however as the movie opened with a long exposition dump by an omniscient narrator who outlines the state of this world in the most inelegant way possible. It was at this moment that I realized this was going to be one of these movies like Dune or Willow that Hollywood made in the wake of Star Wars which sought to take advantage of the willingness audiences apparently had to watch fantasy films but took no note of the steps that movie took to make its universe understandable and relatable. You know, the kind of movie that the fake movie at the center of Argo probably would have ended up being like. More than anything this reminds me of Disney’s similarly titled The Black Cauldron, which was another movie that tried to expand its brand into darker territory but found its many grandiose ideas to actually be something of a mess in terms of fantasy and world building and yet rather bland and formulaic as a narrative. To the film’s credit, there is something pretty impressive about trying to make a movie with this tone and on this scale using only puppets. There was some clear thought put into the film’s various creatures and the film also had some fairly impressive sets like a lab with an elaborate astronomy set-up, but there was one clear puppetry fail and it was a pretty important one: the main character. “Jen” was supposed to be this big breakthrough of puppetry but he proved to be both indistinct and boring as a design and highly unexpressive and inhuman as an effect. It doesn’t help that Stephen Garlick gives him a rather weak voice and that he’s a frankly rather boring and unrelatable character on the page to begin with. In fact when the movie was rolling into its third act I found myself to be pretty actively bored by it. Now, for all the complaining I’ve done about this movie I do want to say I didn’t hate it exactly. Rather, I’m frustrated by the movie because it does feel like there is a good movie hidden in it somewhere that was never really allowed to emerge for the simple fact that the people making it couldn’t really see the forest for the trees and made a lot of mistakes through their lack of perspective. Man, I really thought this was going to be the round where gen X stepped up and started hitting back but that didn’t end up happening. That’s too bad because this movie seems to be having a bit of a moment right now. Netflix is apparently making a prequel series and the original film is getting a UHD release and I think Fathom is bringing it back to theaters. Truth be told I’m not so sure Netflix should want people taking another look at the movie though because it pretty clearly does not hold up. He’s taken an odd route to Hollywood success but the English novelist Alex Garland has somehow managed to work in movies for over fifteen years and doesn’t really have a bad movie on his resume. Beginning with the sale of his novel “The Beach” Garland began a working relationship with Danny Boyle which led to Garland writing screenplays for the Boyle films 28 Days Later and Sunshine, which both had their flaws but which were nonetheless very solid movies and then he went out on his own and wrote the screenplays for the under-rated Never Let Me Go and Dredd but he really became a force of his own in 2015 when he stepped into the director role and made the small scale science fiction film Ex Machina. That was a movie I was kind of lukewarm on when I saw it but which in retrospect I think I was a bit too hard on. That was an original science fiction movie made on a mid-budget, which is a kind of movie critics get really excited for but are also often disappointed by and Ex Machina managed to deliver and even somehow managed to get a visual effects Academy award despite being made on a relatively small budget. He’s now been allowed to make another science fiction film and this time with a bigger budget and despite being made in a major studio his new film Annihilation is just as uncompromising as Ex Machina. Annihilation begins with the sight of some kind of object crashing to Earth and hitting some kind of lighthouse. From there we flash forward and meet a woman named Lena (Natalie Portman), a biologist and military veteran whose husband Kane (Oscar Isaac) has been missing since going on a classified special forces mission a year prior. That ends one day when he suddenly shows up at her door and begins behaving strangely and can’t explain where he’s been and shows signs of deteriorating health. Later that day they’re both stopped and arrested by government agents and brought to a secret facility that sits outside a national park that has been taken over by a strange phenomenon called “The Shimmer” which has encompassed the park (which has been evacuated under pretext of a chemical spill) and seems to be expanding outward. Kane is apparently the only person so far to have returned from The Shimmer and as such Lena convinces a lady named Dr. Ventress (Jennifer Jason Leigh) to let her join the next team to enter The Shimmer in hopes of finding answers. One of the reasons I was a little cool on Ex Machina originally was simply that I was a little tired of the whole “how human are robots” question that science fiction has been batting around for the last hundred years. With Annihilation avoids this problem, in part because it’s a lot less cut and dry about what it’s trying to say or even what questions it’s asking in the first place. In broad strokes it’s pretty clear what “the shimmer” is insomuch as it appears to be some sort of alien terraforming effort but the exact reasons for its creation and the full extent of what happens there is less defined. The area is plainly reminiscent of “The Zone” from Andrei Tarkovsky’s Stalker in that it’s this seemingly earthly area where few people opt to venture because of the strange things that happen there. Also like Tarkovsky’s film the mission that Lena and her compatriots go on seems less like an adventure and more like a grim inevitability they’re driven to by various personal demons. Unlike Stalker though Annihilation has some more conventional genre thrills along the way. I don’t want to give away too much of what goes on inside of “the shimmer” but the is a horror element to it including some creature effects that are somewhat reminiscent of John Carpenter’s The Thing and some of the group dynamics as the trip into “the shimmer” reminded me a bit of The Blair Witch Project. In short, Annihilation is quite a trip. It’s a thoughtful science fiction movie but one with imagery and structure that make it an entertaining viewing. The most obvious recent touchstone for the movie would likely be the 2016 film Arrival, which was probably the last intelligent science fiction movie to really catch on with the public. 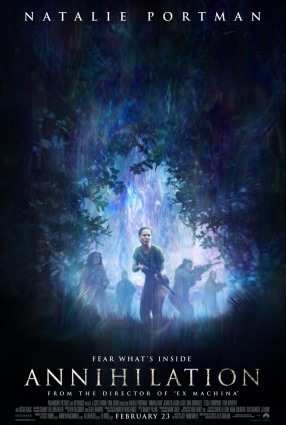 Both films are about women tasked with making contact with aliens who have appeared on Earth for mysterious reasons, but Annihilation is a little more visually adventurous and a little less generous in doling out its meaning. This is a movie that’s going to keep people guessing and theorizing for a while, maybe not as long as one of Tarkovsky’s science fiction films, but certainly longer than most of the movies that Hollywood gives us. The weird thing about the Marvel Cinematic Universe is that the critics seem to hate the MCU as an enterprise and yet they seem to like every individual film in the MCU and whenever one comes out they seem to forget that they’ve liked every individual film. Like, when Thor: Ragnarok came out last year the critics were all saying “oh my god, they really let Taika Waititi inject his signature humor into this, it’s so much different than those other Marvel movies.” Of course four months earlier they were saying “oh my god, they really managed to turn Spider-Man: Homecoming into a down to earth high school movie, it’s so much different than those other Marvel movies.” And the year before that the critics were saing “oh my god, they really managed to turn Doctor Strange into a crazy acid trip, it’s so much different than those other Marvel movies.” So on and so forth. Critics also have a history of going overboard with their praise whenever a film seems to be an advance in representation in Hollywood cinema, something which led a lot of critics to really lose their minds when presented with good but not truly extraordinary movies like Wonder Woman, Bridesmaids, and The Big Sick. As such I was pretty cautious when the raves and hype for the newest Marvel film Black Panther started rolling in as I feel a bit like I’ve been cried wolf to before when it comes to movies like this. The action in Black Panther picks up about a week after the events of Captain America: Civil War, the movie which introduced the character. With his father dead the time is now for young Prince T’Challa (Chadwick Boseman) to be officially crowned as the king of Wakanda. Wakanda is a fictional African country built on top of a reserve of a material called vibranium, a metal so useful and powerful that it trumps all the guns, germs, and steel that have allowed colonial powers to dominate other African countries for centuries. They’ve used that technology to build some kind of cloaking device that hides their futuristic capital city and have generally hidden their incredible technology for centuries. Shortly after his coronation T’Challa gets intel that an enemy of the Wakandans named Ulysses Klaue (Andy Serkis) is going to be in South Korea selling a stolen vibranium artifact. 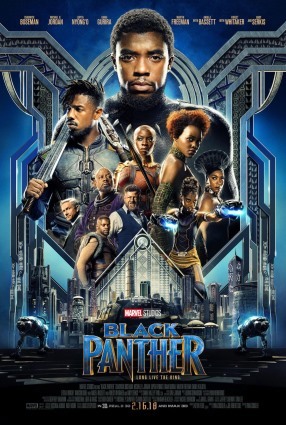 T’Challa promises his confidant W’Kabi (Daniel Kaluuya) that he will kill or capture Klaue, retrieves his new suit from his sister Shuri (Letitia Wright) and heads to Korea with his to top agents Nakia (Lupita Nyong’o) and Okoye (Danai Gurira). Once there he finds an undercover CIA agent named Everett K. Ross (Martin Freeman) also on the hunt for Klaue, but what neither of them know is that Klaue is now in league with a man named Erik Stevens (Michael B. Jordan), who has grand plans that could have grave consequences for Wakanda. Aside from the fact that the character was introduced in a previous film (a fact that would not be terribly apparent to people just jumping in here) Black Panther feels mostly independent from the wider world of the Marvel Cinematic Universe and outside of a couple of technical elements it does feel somewhat distinct from that Marvel house-style. The biggest thing that sets this apart is its setting in Wakanda, which is quite the creation. It takes a few leaps of logic to buy that this civilization could completely hide itself for so many centuries (how long have they had that cloaking device?) and the notion that they spent all these years living in peace and harmony with their neighbors despite having overwhelming advantages over them goes a bit contrary to human nature, especially given that they apparently select their rulers through trial by combat. Still, once you get past that this is a really interesting place to be setting a movie. We’ve seen plenty of science fiction versions of European and Asian cities but we’ve basically never seen a vision of a technologically advanced Africa brought to the screen with anywhere near this kind of budget or scope and it gives a very interesting flavor to the whole movie. We see things that would be neat sci-fi tech in any context like a line of soldiers with force field shields and make them that much more unique by having them be tied to said soldiers’ African garb for example. If Black Panther has a real problem it might be that it’s a touch over-crowded with a large cast of supporting characters who almost begin to overshadow the title character in his own film. For instance, the characters of Nakia and Okoye feel a touch redundant, both basically just act as glorified sidekicks and one or the other likely would have been sufficient. Martin Freeman’s Everett K. Ross is also a somewhat interesting presence in the movie but is also largely story irrelevant outside of his role as an outsider who can ask questions on behalf of the audience which probably didn’t need extra explaining. The Forest Whitaker and/or the Angela Bassett character also probably could have cut down as we probably only really needed one tribal elder character to explain some of the backstory. It gets to the point where, in the film’s finale, we get three different action scenes being intercut and the one where our hero is fighting the main villain is plainly the least interesting of the three. Still there are a lot of side characters here who do work quite well. I liked Letitia Wright a lot as T’Challa’s younger sister Shuri who acts as a sort of Q figure giving gadgets to our hero and I particularly liked the film’s villain The Killmonger. Michael B. Jordan isn’t necessarily the most physically intimidating villain Marvel has ever put forward what with his youthful demeanor and wacky Jaden Smith haircut, but he has motivations that generally make sense and you can divine a bit or a Trump allegory in the way he uses holes in the Wakandan succession laws to become a dangerous person in power. On a pure filmmaking standpoint Black Panter is perhaps a bit of a step backwards for Ryan Coogler. There are a couple of cool action scenes here, especially a car chase around the film’s midpoint but these scenes are a bit over-edited and there are a couple of moments of questionable CGI (the rhinos were a bit much). I found the boxing scenes in Creed to better rendered in their simplicity, but perhaps that’s inherent to making big action scenes in Marvel movies. I’m not exactly sure where I’d rank the movie within the annals of the MCU, especially given that Marvel has been varying things up lately and these comparisons have become a bit harder to make. Visually it’s pretty high up there but maybe not as high up there as Doctor Strange, as a thriller narrative it’s also up there but maybe not as high as Captain America: The Winter Soldier, and in terms of action it’s fairly high up there but maybe not as high as The Avengers. Still there is an x-factor here that cannot be ignored; we simply haven’t seen an African science fiction movie like this before and that isn’t something to be ignored. That’s something that sets it apart from last year’s “glass ceiling breaking” superhero movie Wonder Woman, which really didn’t do anywhere near as much in its imagining of a matriarchal society. I’m only really able to ride the hype train on this thing so far, at the end of the day it’s a bit messy, but the things it does right it does very right.